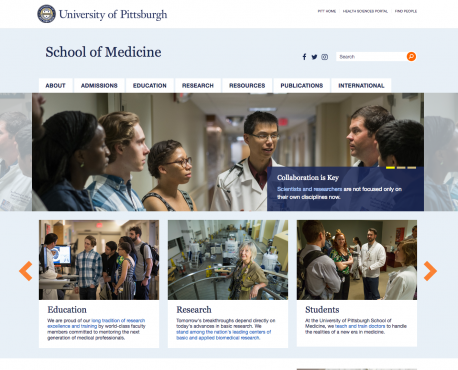 Our team has created more than 350 sites currently hosted at Pitt. While units manage routine content updates through the content management system (CMS), our team provides technical support and content/strategy guidance on more complex updates. We routinely work with units to establish and manage sites reaching both external and internal audiences. While we do not maintain content for most units, we strive to build sites that offer compelling design, user-friendly content management, and an intuitive and rewarding user experience. 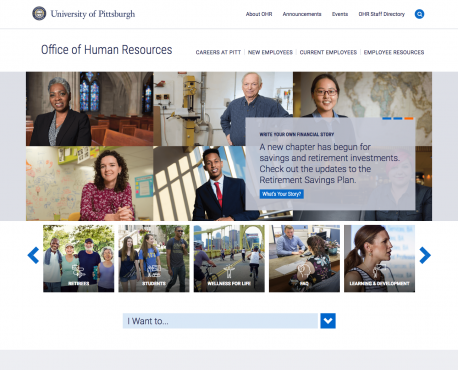 A complete reorganization of the Human Resources site made it easier for visitors to find its most popular sections based on services (employee resources, health benefits, etc.) and audiences (new and current employees, students, retirees). Special features include a "Stay Connected with Us" page with links to social media and transportation resources. This hub for future medical professionals required a face lift. The newly launched site now reflects the school’s impressive legacy and will benefit any of the school’s future partnerships and attract support. 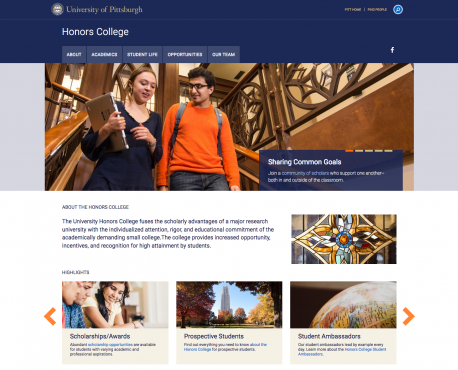 The launch of the new Honors College website was an important goal for new Dean Brian Primack. 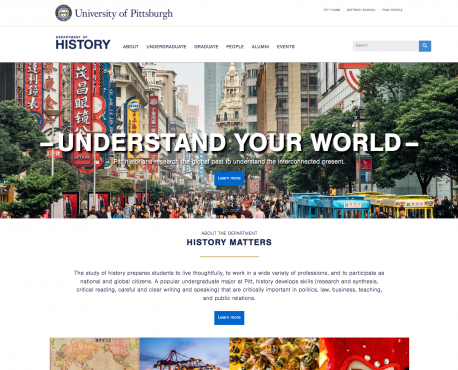 The site was built using one of the Pitt-themed templates along with new pictures that were art-directed and photographed by our team. The site has helped to streamline content and give a fresh face to a college enjoying exciting new endeavors. The school completely revamped its website with a fresh design and new content architecture. 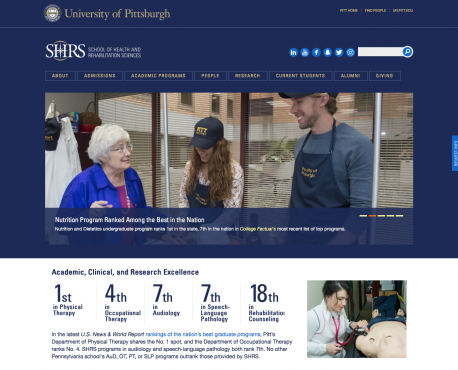 It is one of the largest and most complex Pitt websites, featuring six departments and more than 35 programs, with each functioning as a mini-website with unique functionality and custom permissions. Extensively updated in summer 2017 as Kathleen Blee became dean, this site serves as a portal to the school’s 45 departments and programs. 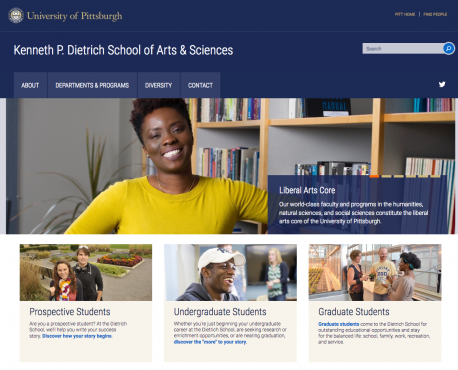 Special features include a virtual tour, a diversity page, and a link to the Dietrich School’s e-newsletter, which our team also produced. 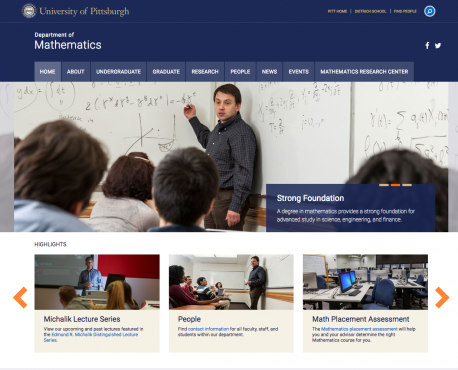 The Department of Mathematics was ready to overhaul its old site for something more clean, streamlined, and easy to update. With more than 50 pages and several unique content types, Mathematics is one of the larger and more intricate sites we have developed for the Dietrich School of Arts and Sciences. 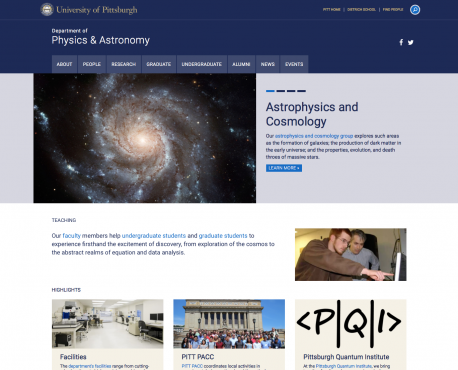 With an accreditation review coming up, Physics and Astronomy needed to update and upgrade its site ASAP. In a reduced time frame, Web Services migrated the department's site content into a more intuitive and responsive structure, launching just in time for a successful review. 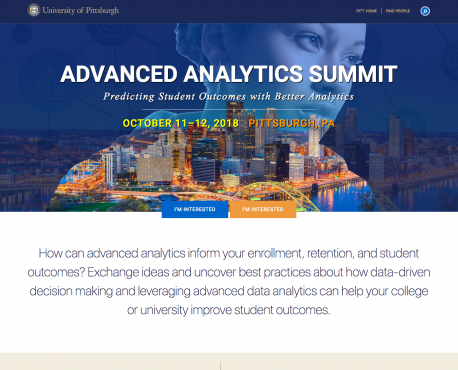 This site promoted and registered attendees for the first-annual Advanced Analytics Summit, dedicated to best practices for using data to influence student enrollment, retention and student outcomes. The site provided information about speakers, panelists, hotel reservations, transportation, and Pittsburgh for first-time visitors. The department wanted a redesigned website that provided a compelling and modern interface. Extensive attention was paid to developing a structure that enables users to sort and filter faculty members by professional classification, regional field of study, and research clusters. Like our other sites, this one incorporates a new back-end content management system and is responsive on various mobile devices. 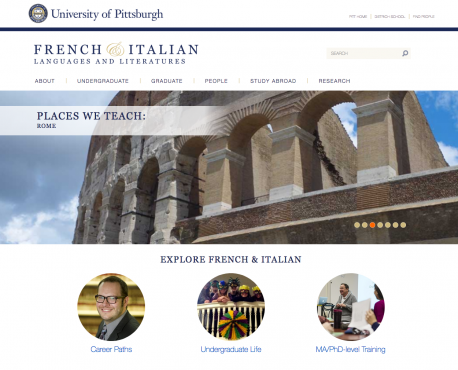 We updated this University Communications-created site with more recent photos, and strengthened its Graduate and French sections to support the department’s plan for recruiting students from France. 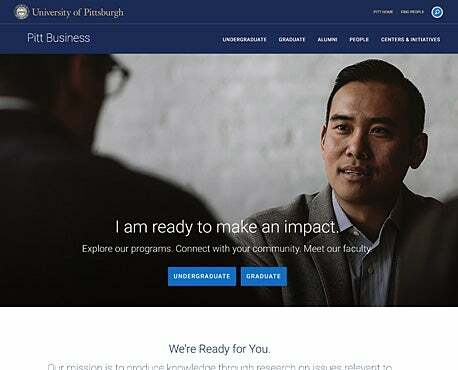 Business.pitt.edu serves as a portal to the College of Business Administration (undergraduate studies) and Joseph M. Katz Graduate School of Business sites. 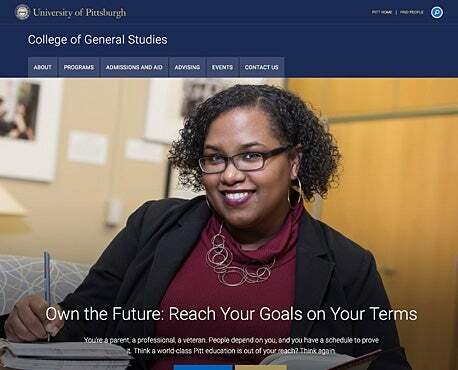 While primarily a student recruitment tool, the site also connects visitors—including industry partners and employers—to Pitt Business strategic centers and initiatives, and it provides comprehensive information for alumni. 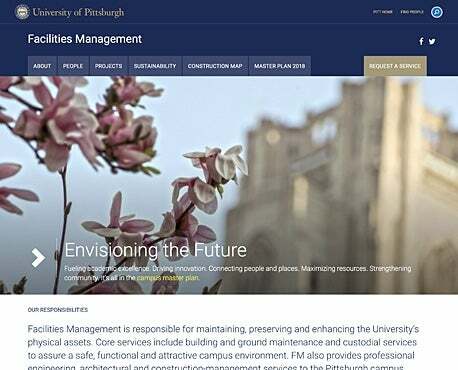 Facilities Management updated its site in 2018. It showcases recent building renovation projects and updates, shares construction updates with the community, and highlights FM’s core services. The site upgrade added up-to-date images and incorporated new features that allow for effective marketing of department goals, such as a quick-icon area to help users access information they need quickly. Our team updated the College of General Studies site's user interface and overall graphic look, using our University Web theme. With easier navigation that provides infomation and services clearly and concisely, the site better serves the needs of prospective and current students.